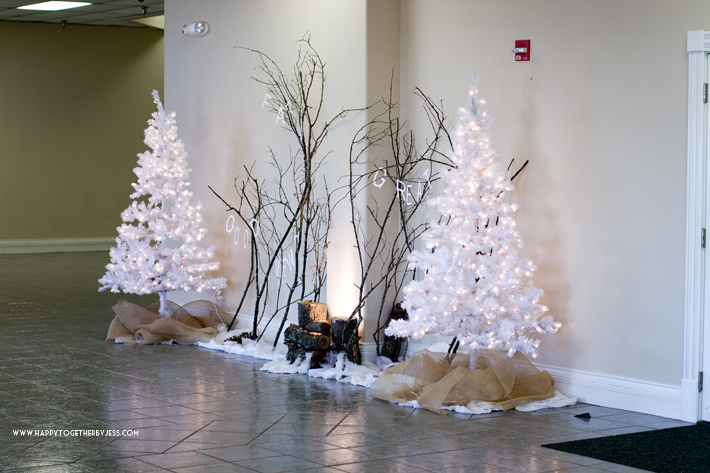 I have shared before how I volunteer to help with decorations at our church (Mother’s Day, February) . It’s been a lot of fun creating things I wouldn’t normally do and last week was no exception. 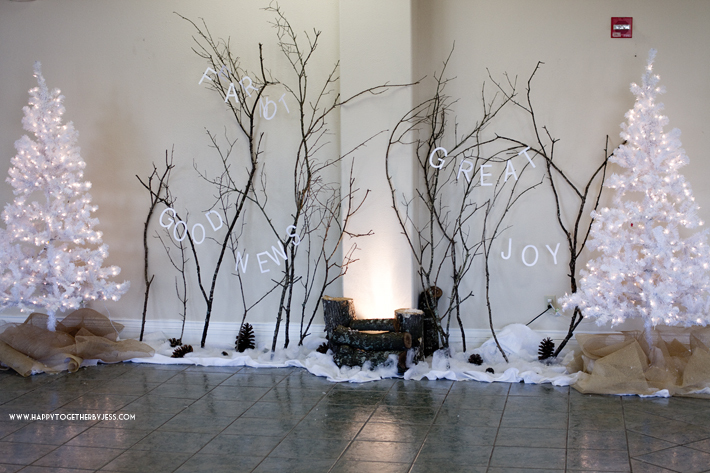 When determining what we are going to do for decorations we focus on two things: what the message will be and how creative can we get to use as little as a budget as possible. 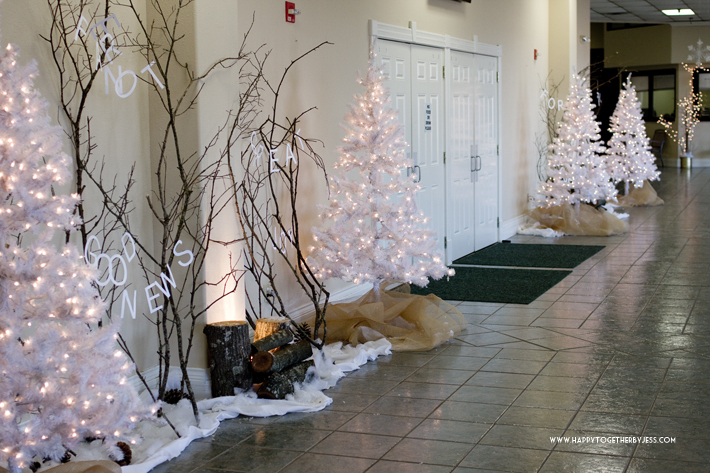 Since Christmas is one of the bigger holidays for church, we wanted it to be a little bit larger scale than we normally do. We first went into storage to see what was already there. 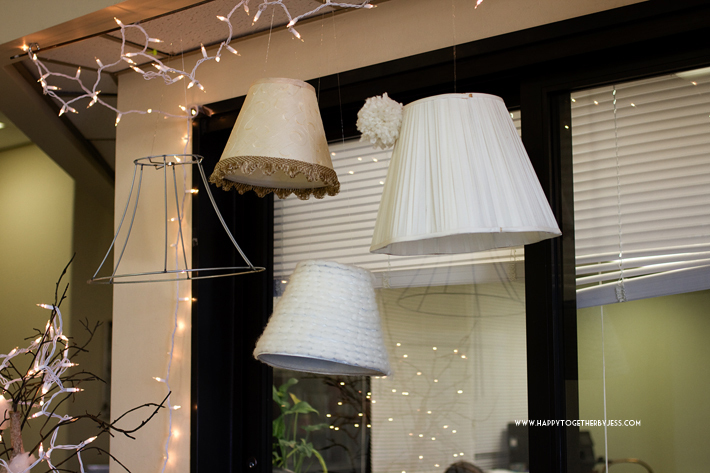 We found these four white trees, burlap, old lamp shades, and a fake tree that I had deleafed earlier in the year in hopes of using it at some point. 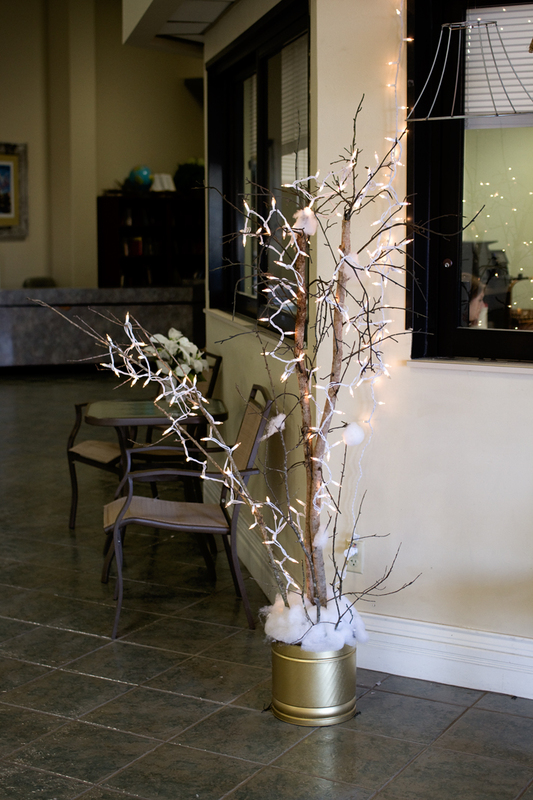 We first put the trees up with the burlap and decided to go get some fake snow stuff to go in between. It ended up being a layer of felt like blankets we found in storage, snow batting spread out randomly, and fake powder snow flakes sprinkled on top. 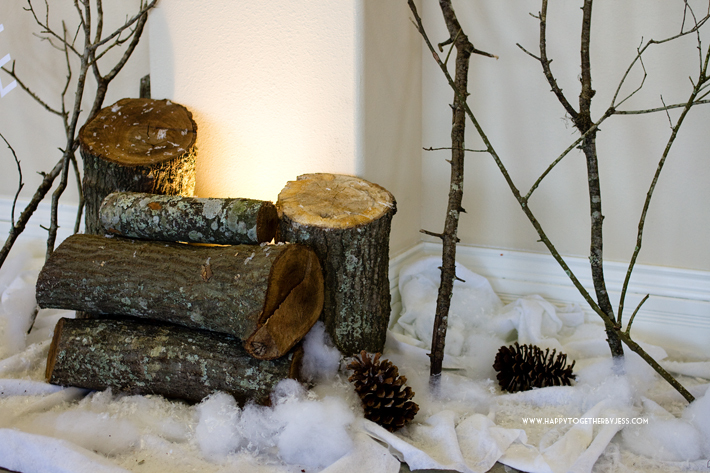 We already had a bunch of branches I had used on a thankful display for Thanksgiving, so we reused them here along with some wood logs and pine cones. 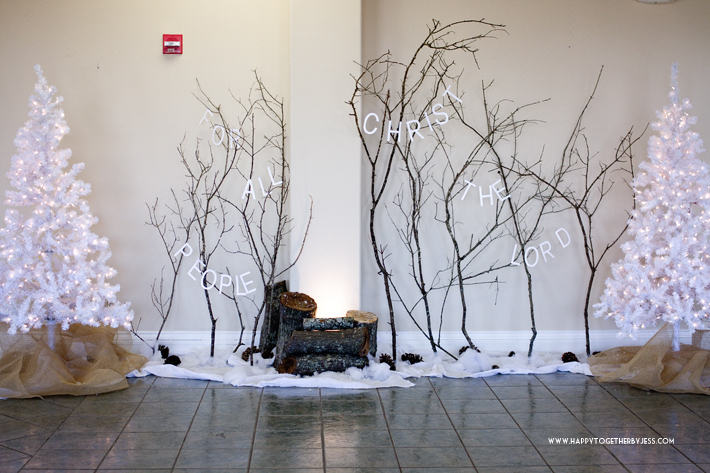 The Bible verse focus for this display was to be Luke 2:10-11, so I used my Cricut Explore to cut out a few phrases from that text and tied them onto the branches. 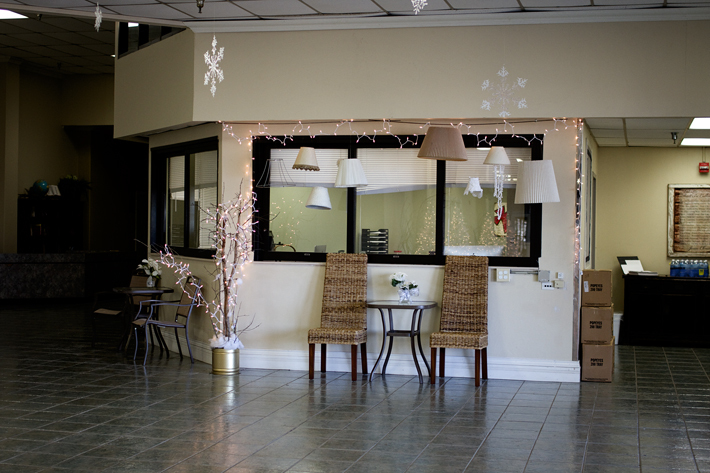 Oh, and we found these plug in can lights that we used to add some lighting in the middle. We wanted to hang something from the ceiling as well. 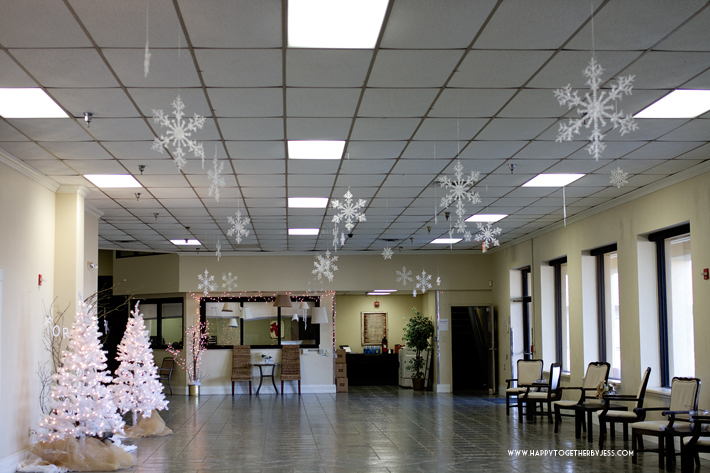 It took a while, but we finally found these large and small snowflakes at the Dollar Tree to use. 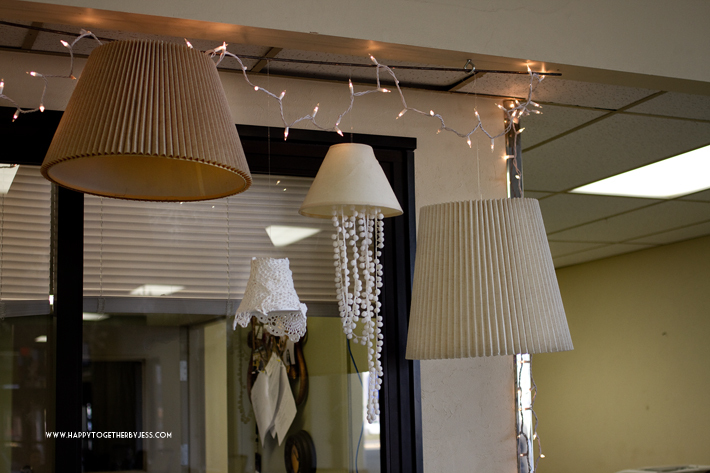 I fixed up some of the broken old lampshades a few ways. The bare one was actually one of mine I just stripped the fabric off of. The top beige one needed a little oomph so I glued on some trim. I added a pom pom to another and then that bottom one looked like it had been painted, so I glued yarn all around it to cover that up and add some texture. We found a little tiny lampshade at Walmart to be a filler and I covered that in doilies I had collected from Michaels and JoAnns. I added a strand of pom pom trim to hang on the next one and then spray painted that one on the end white to lighten it up some. Welcome to my blog Happy Together. 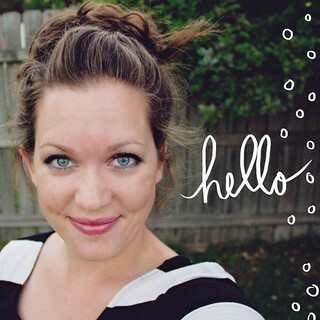 My name is Jessica Fediw and this is where I share my adventures in life, crafting, and more. Thanks for stopping by! The images and content of Happy Together are protected by copyright laws. DO NOT distribute or copy the content found within this blog without written permission. DO NOT edit or remove watermarks from any image. If you want to share an image feel free to pick just ONE IMAGE with a direct link to its original post. For questions contact me. Thank you!